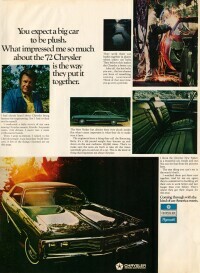 Like all 1972 Chrysler Corp. full size cars, the Chrysler models were restyled but still continued the Fuselage design. Changes affected the front, rear and side sheetmetal. Up front, there were still loop-type front bumpers that now featured a center divider bar. Newport tail lights were slightly curved and of a more vertical style, half set into the sheetmetal, half set into the rear bumper. The body sides now were more rounded and came without the former crease below the side glass and up the C-pillar. On two-door hardtops, the forward edge of the C-pillar was almost vertical. Under the hood, the introduction of electronic ignition was a real progress. The new 400 cui engine was the Newport standard powerplant to make up for reduced compression which would have strongly affected the old 383's performance. 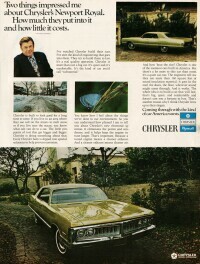 The 1971 Newport Royal's 360 cui small block standard engine was also no longer offered. Front power disc brakes were now standard on all Chrysler models. Interiors didn't change much, the trend towards high-back bucket seats in high-level models or as an option continued. New seat fabrics became available, too. For the first time, a vinyl roof could be ordered for Town & Country station wagons. 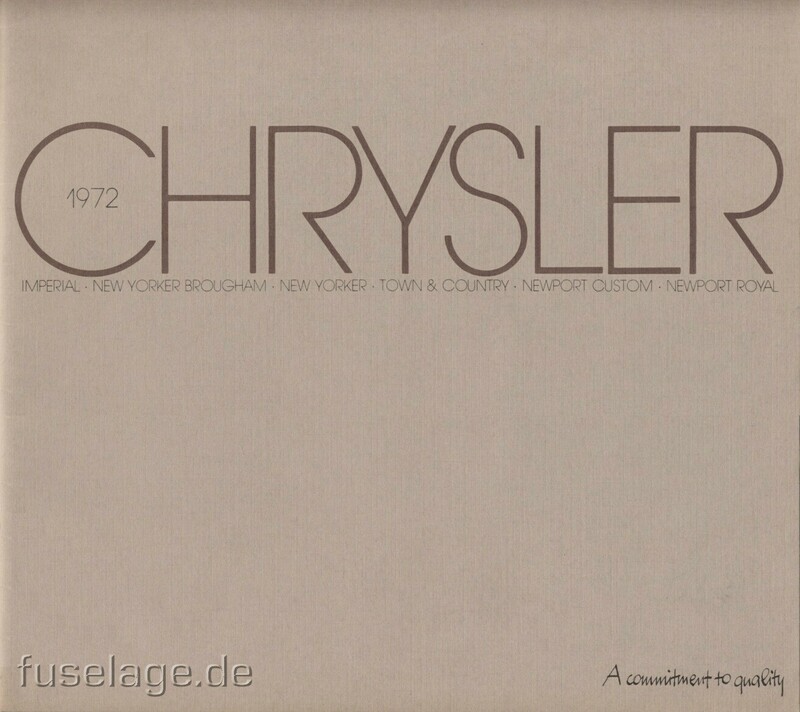 A New Yorker Brougham model led the lineup as the top-of-the-line Chrysler (but still being inferior to the Chrysler Imperial models). Positioned below were the New Yorker models, followed by the Newport Custom. The Newport Royals now were an integral part of the lineup and replaced the regular Newports. As usual, there was the Town & Country wagon. 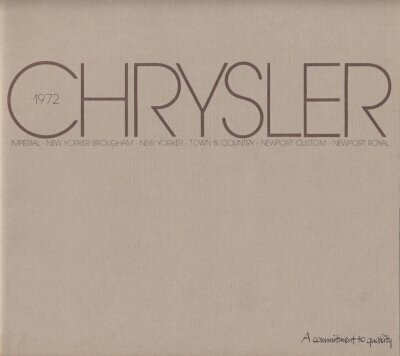 The legendary 300 nameplate was discontinued for 1972. 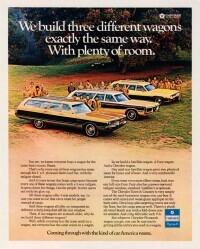 All models except the Town & Country were available in 2-door Hardtop, 4-door Hardtop and 4-door Sedan body styles. 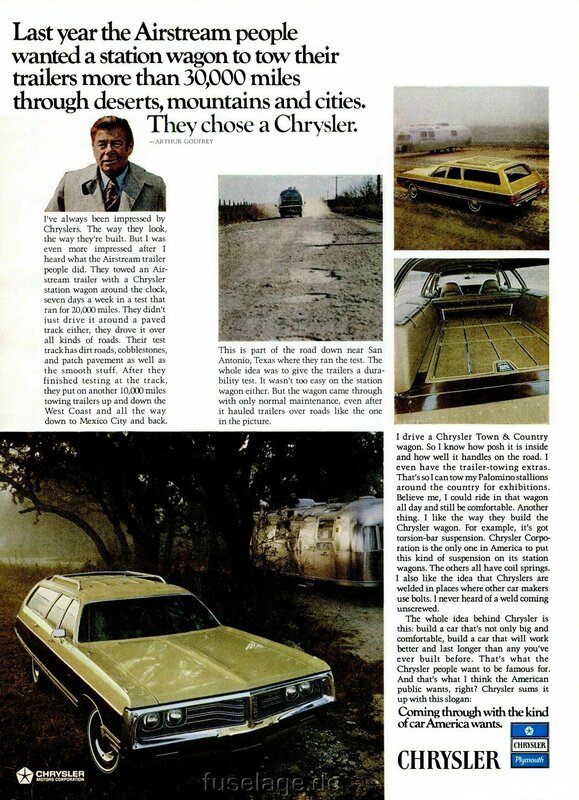 "Nine out of ten new Chryslers registered in the last ten years are still on the road." 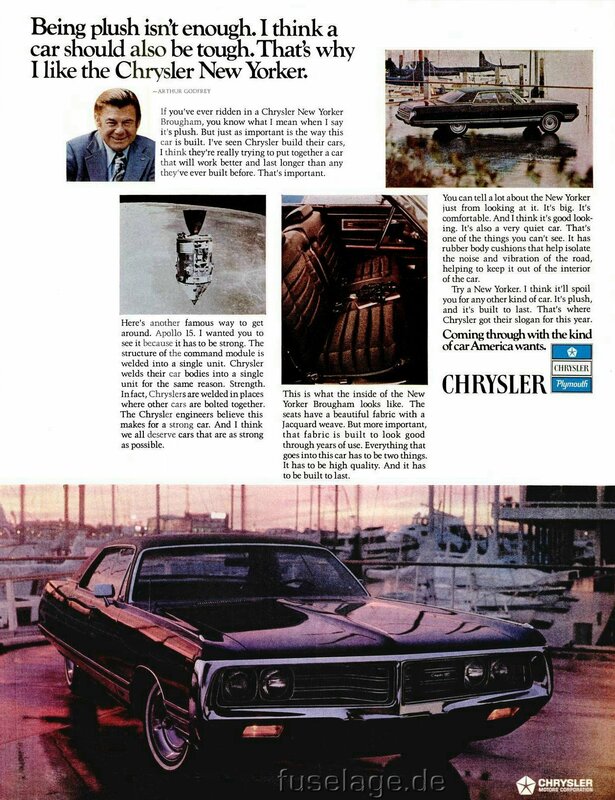 With this headline in the depicted magazine advertisement, the Chrysler division wanted to fight rumors of poor quality in their products. The cars turned out to sell better than the 1971 models, but this might as well be credited to the slightly restyled sheetmetal. Radio host, entertainer and actor Arthur Godfrey was the anchor man for the 1972 and 1973 camapign. He was 69 years old then, so that should tell you something about Chrysler's targeted group of buyers. Another magazine advertisement picking up the "quality" theme. 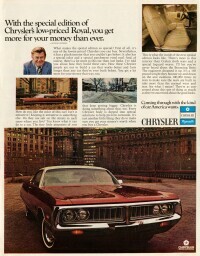 Car shown in this ad is a New Yorker four-door hardtop. 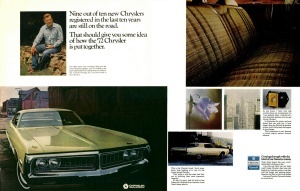 This advertisement shows the Chrysler Newport Royal, the new Chrysler economy model first introduced in 1971. Again, the rest of the copy text emphasizes the high quality of Chrysler products. 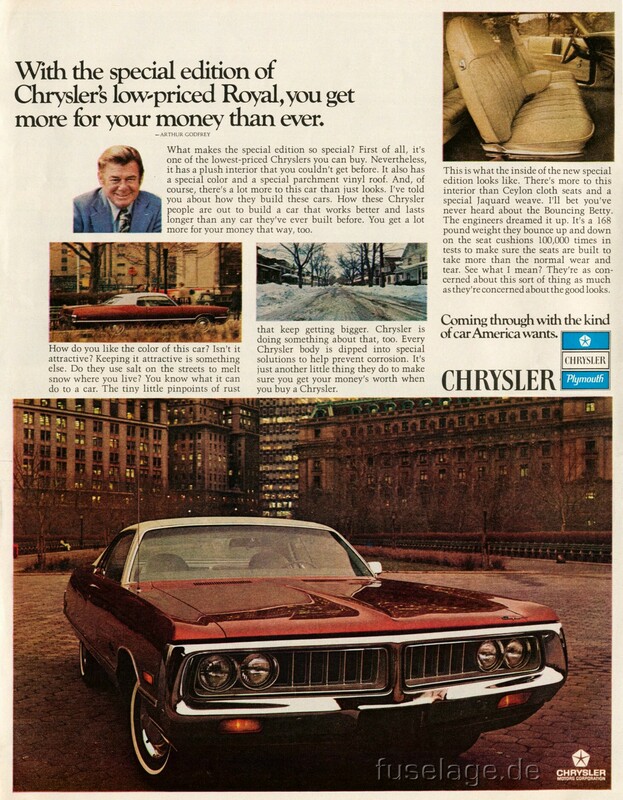 As if the Chrysler Newport Royal wasn't bargain enough, this spring ad introduces the Newport Royal Special Edition with seats from the Newport Custom, a vinyl top and a special exterior color being standard fare. A regular bench seat would otherwise have been the standard furniture in a regular Newport Royal. 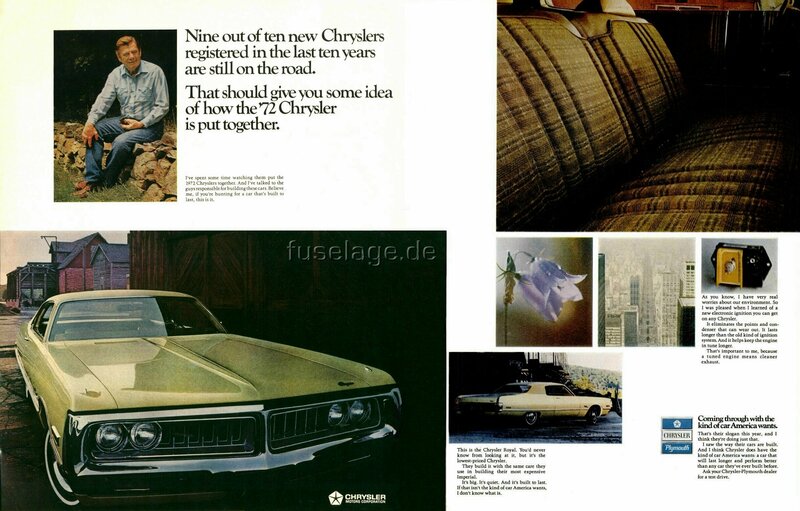 Just in case you ever wondered what the Apollo lunar module and a 1972 Chrysler have in common, this ad explains that both are "welded into a single unit" to make it strong. 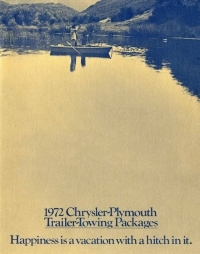 This ad tells the story of how Airstream trailers were tested by being pulled by a Chrysler Town & Country over all sorts of roads for 30,000 miles. 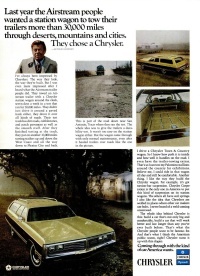 Plus Arthur Godfrey commits to owning a Chrysler Town & Country to pull a trailer with his Palominos in it. 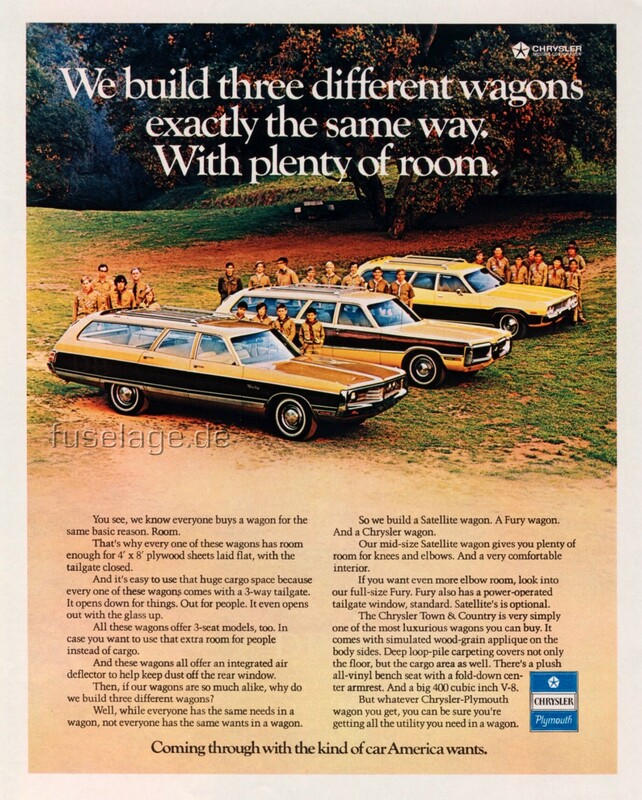 There was also a special station wagon advertisement that featured not only the 1972 Chrysler Town & Country but also the Plymouth Sport Suburban and the Plymouth Satellite wagon. 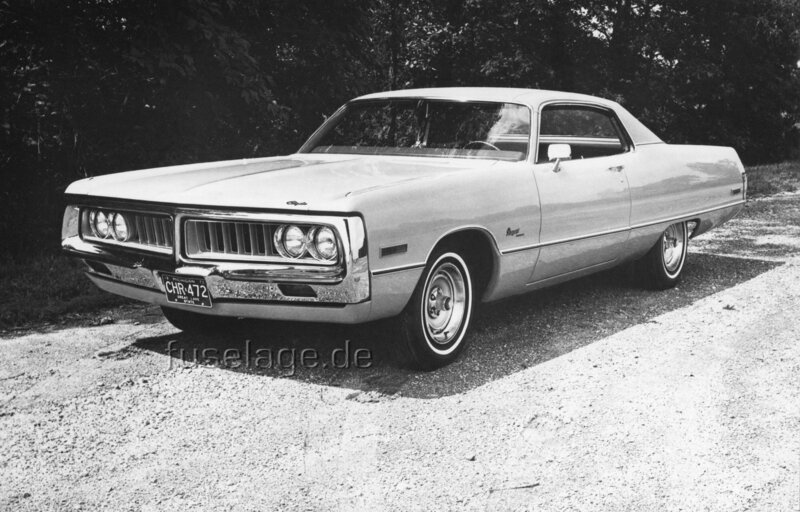 This is a press photo of a 1972 Chrysler Newpot Royal two-door hardtop with optional chrome styled steel road wheels. 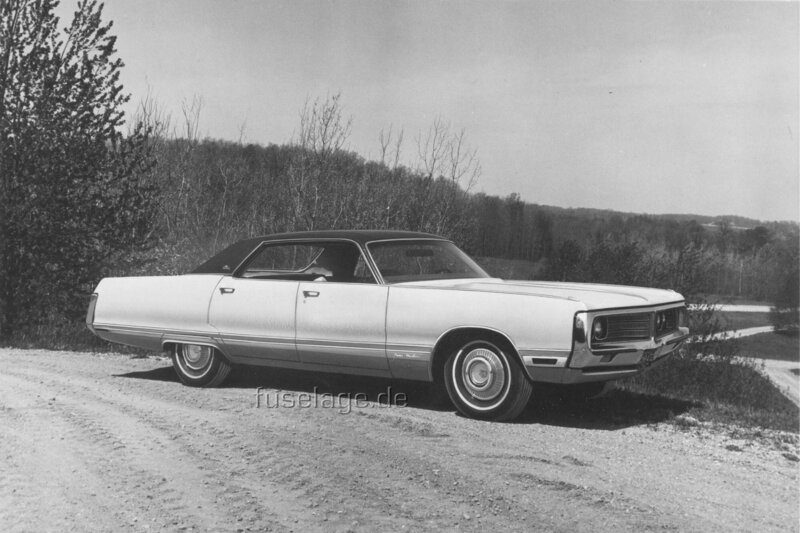 Press photo of a 1972 Chrysler New Yorker Brougham four-door hardtop. Here is a rarely seen cutaway drawing of a 1972 Chrysler Newport Royal four-door sedan. Ample room for passengers and luggage.